This is the second half of the document I had started to share in my previous post. Part one offers some creative ways to modify a skeleton combat to make it more interesting than the typical "smash and grab" encounter. You can find that article here. Part two concerns itself with variant skeletons. The Pathfinder RPG Bestiary offers the bloody and burning skeleton variants; below are seven more variants that I have created. 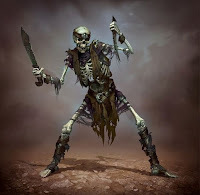 Skeletons are the most basic form of undead to exist and one of the first types that a fledgling necromancer is likely to learn to create. Because the skeletal system does not decompose like living tissue, it can be animated regardless of how long ago the original creature perished. Although skeletons are the most simplistic form of living dead, much research has gone into the augmentation of these unnatural creations to make them more resilient and more dangerous. Each of the following skeleton types modifies the base skeleton in a few key ways. Except as noted, these variations can be stacked with one another. Skeletons are easily destroyed when subjected to even a moderate blow. However, some unique methods of preparing a skeleton before animation have been discovered for increasing its durability. One technique involves a special alchemical solution of liquid adamantine. Unsurprisingly, the precise formula is a closely guarded secret of alchemists and necromancers alike. Prior to animation, the entire skeleton must be fully submerged in the emulsion, during which time it undergoes a process similar to natural petrification. As a result, the bones acquire a metallic sheen - a strong clue as to the skeleton's nature for those in the know. After 24 hours, the skeleton can be extracted and animated as the necromancer desires. The adamantine variation cannot be combined with the fossilized variation. Challenge Rating: As a normal skeleton +1. Defensive Abilities: An adamantine skeleton loses its DR 5/bludgeoning and gains DR 10/-. Some remote cultures consider it a mark of honor to serve one's community or diety after death. In these cultures, renowned individuals are chosen to be returned from the dead. The manner in which an individual is chosen varies between mores but, in every case, it is considered to be the greatest of proviliges. 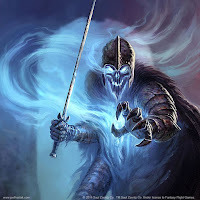 Unlike other undead, which are typically raised gainst the will of deities - if not the creature itself - these corpses are animated with the divine consent of a good- or neutral- aligned deity for a specific purpose, such as guarding over a holy site or to serve as a chieftain's elite body guard. Challenge Rating: As a normal skeleton. Alignment: Always neutral good or true neutral, depending on the consenting deity. A blessed skeletal champion can be of any good or neutral alignment. Defensive Abilities: A blessed skeleton gains the positive energy affinity ability. The creator of a blessed skeleton that is not of a good alignment may choose to give the skeleton this ability. Positive Energy Affinity (Ex): The creature is not alive but is healed by positive energy and harmed by negative energy, as if it were a living creature. A corrosive skeleton undergoes an additional step in the preparation of its animation by being saturated with a caustic fluid. Typically this involved being submersed in a viscous acid for an extended period of time. A special alchemical additive prevents the corpse from being destroyed by the acid. Although this adds a significant delay in the animation process, the result is a formidable and feared monster. Corrosive skeletons do not wield weapons or wear armor as their caustic touch quickly decays the equipment. In addition to the standard changes for the skeleton template, make the following adjustments to the base creature. Challenge Rating: As a normal skeleton +2. Defensive Abilities: Corrosive skeletons gain immunity to acid damage. Melee Attacks: A corrosive skeleton's melee attacks with natural weapons deal an additional 1d6 points of acid damage. Special Attacks: Corrosive skeletons have the corrosive ichor special attack. Corrosive ichor (Ex): Anyone striking a corrosive skeleton with an unarmed strike or natural attack takes 1d6 points of acid damage. Whenever a character strikes a corrosive skeleton with a manufactured weapon, the weapon takes 1d6 points of acid damage. Clerics, mages, and necromancers harness negative energy to animate and control undead. When the physical corpse is destroyed, the necrotic power energizing it typically dissipates with minimal impact. Sometimes, whether done intentionally or as the result of a misstep in the animation process, the negative energy disperses with volatile consequences. The resulting explostion turns the remaining bone fragments into dangerous shrapnel. Hit Dice: An exploding skeleton's Charisma is considered to be 4 for the purpose of determining its hit points. Special Attacks: Exploding skeletons have the shrapnel special attack. Shrapnel (Su): When an exploding skeleton is reduced to 0 or less hit points, it shatters into countless shards that cause 2d6 points of piercing and slashing damage to all creatures adjacent to it. A successful Reflex save (DC = 10 + 1/2 the skeleton's Hit Dice + the skeleton's Cha bonus) halves the damage. One of the most unsettling aspects of a skeleton is the way its skull appears to be constantly smiling. Some sorcerers and necromancers enhance their minions by playing off this disturbing visage. In addition to the changes for the skeleton template, make the following adjustments to the base creature. Aura: Grinning skeletons possess the unnerving countenance aura. Unnerving countenance (Ex): Creatures within 10 feet of a grinning skeleton that have line of sight to it must succeed at a Will save (DC 10 + 1/2 the skeleton's Hit Dice + the skeleton's Cha bonus) or, for the next hour, they become shaken whenever they are adjacent to any skeleton. Passing the saving throw renders the creature immune for 24 hours. This is a fear effect. Special Attacks: Grinning skeletons have the maniacal laughter special attack. Maniacal laughter (Su): Once per day, a grinning skeleton may unleash a spiteful cackle as a standard action. Any living creature within 30 feet of the grinning skeleton must succeed at a Will save (DC = 10 + 1/2 the skeleton's Hit Dice + the skeleton's Cha bonus) or become shaken for 1 minute. This is a sound-based, fear effect. The oldest of skeletons eventually undergo petrifaction. This natural process strengths the creature when it is eventually animated and makes it less susceptible to magic. In addition to the changes for the skeleton template, make the following adjustments to the base creature. Defensive Abilities: Fossilized skeletons lose DR 5/bludgeioning and gain DR 5/adamantine. Speed: Size Medium or larger fossilized skeletons reduce their base speed by 10 feet. Special Abilities: Fossilized skeletons gain immunity to magic. Immunity to magic (Ex): A fossilized skeleton is immune to any spell or spell-like ability that allows spell resistance. In addition, certain spells and effects function differently against the creature, as noted below. A transmute rock to mud spell deals 1d6 points of damage per caster level to a fossilized skeleton, with no saving throw. Transmute mud to rock immediately heals any and all damage currently suffered by a fossilized skeleton. A stone to flesh spell does not actually change the skeleton's structure but negates its damage reduction and immunity to magic for 1 round. The fossilized variation cannot be combined with the adamantine variation. A rime skeleton is coated in a layer of hoarfrost that saps the warmth of nearby living creatures. In addition to the changes for the skeleton template, make the following adjustments to the base creature. The rime variation cannot be combined with the burning variation. Aura: Rime skeletons possess an icy aura. Icy Aura (Ex): Creatures adjacent to a rime skeleton suffer 1d6 points of cold damage at the start of their turn. Anyone striking a rime skeleton with an unarmed strike or natural attack takes 1d6 points of cold damage. Defensive Abilities: Rime skeletons gain vulnerability to fire damage. Melee Attacks: A rime skeleton's melee attacks (including both those made with a natural weapon and those made with a manufactured weapon) deal an additional 1d6 points of cold damage. Abilities: A rime skeleton's Charisma is 12.